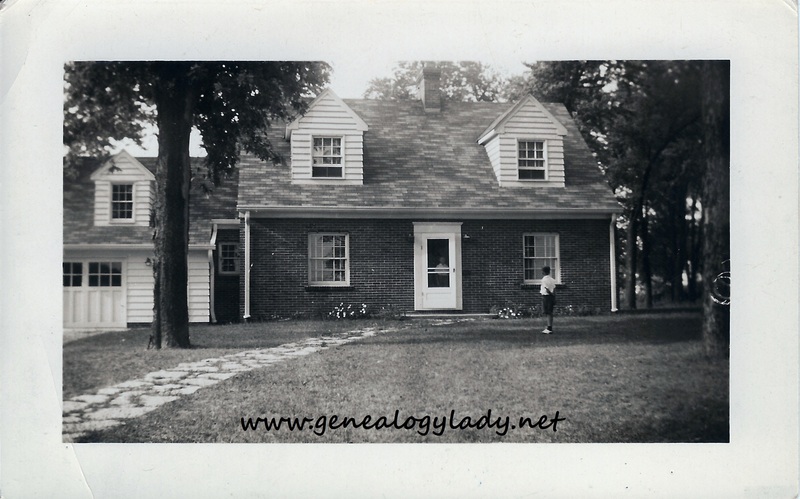 Dear Daddy – A windy day – such a wind all night that I was afraid the S. E. dormer would lift right off and blow away, a time or two the wind hit the metal pieces of the windows just right to make them buzz – it was so loud it awakened David twice. I had to get up and go over to his bed and get him quieted down. I feel a little sleepy today. Mr. Healy came out today to assess us and he said he thought we got the tail end of a cyclone – – Mrs. Roberts called me this a.m. – she had some letters from Joe and he is being moved – you may see him some time. The boys wrote you thanking you for the souvenirs. They said your imagination was better than theirs but I think mine is better than theirs. I didn’t get any letters today. The first letter I rec’d after you could write you said you had written three but to date those haven’t come. Mrs. R. said Joe’s uniform money just came – so maybe yours will come sometime. I haven’t bought any bonds so far this year – was waiting for that money to come. There is a 13 billion Bond drive on now – – I was out spading some – had D. out for first time in almost a week. He sat in his buggy and watched me work then got sleepy so brought him in and he is taking a nap. I want to go back and work some more in a little while and get broken in again. 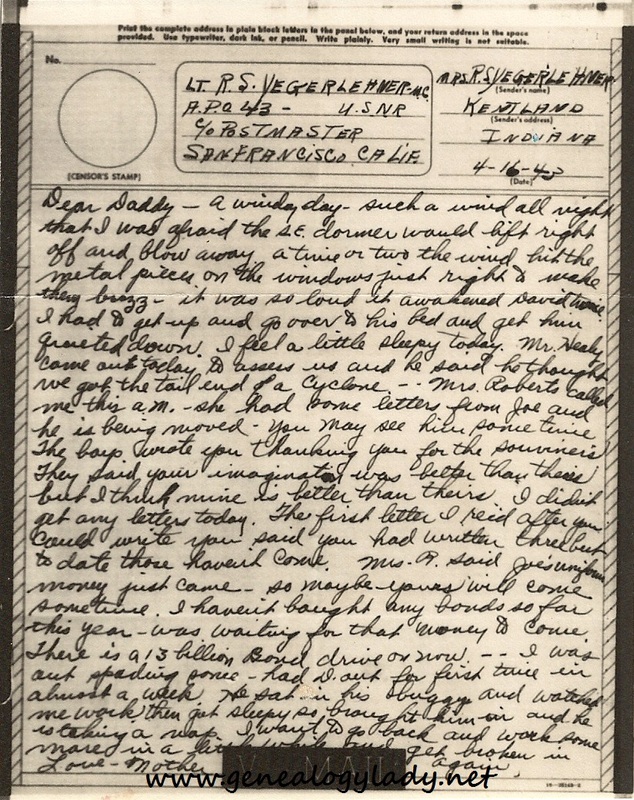 This entry was posted in Foster, Genealogy, World War II, World War II Letters, Yegerlehner and tagged David A. Yegerlehner, Dr. Joseph Roberts, genealogy, Gladys R. (Foster) Yegerlehner, Kentland, Mr. Healy, Mrs. Leila Roberts, Roscoe S. Yegerlehner, World War II, World War II letters on April 19, 2014 by Deborah Sweeney. The use of the word “cyclone” is a little strange. The most common word in the midwest was (and still is) “tornado.” I remember more than once my mother coming to my room when I was little…during storms, to check on me. Does that %#&^$%#$^@ uniform money ever arrive? We’ve been hearing about it forever! And I agree, watching other people work can be soooo hard.